I'm the sort of person who can never, ever think up a witty comeback in the moment. In fact, I usually have to sleep on it before something pops in my mind. Caroline is even worse...it takes her decades to come up with someone. This is a delightful book about self-empowerment. Caroline is the mousy woman who is pushed too far. 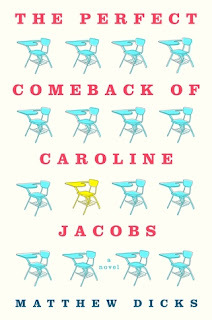 Add into the mix a rebellious teen-aged daughter and haunting memories from her childhood, and Caroline is on her way. My main complaint with this book is that I felt it should be longer. This is not because the book was just so charming that I couldn't put it down (it was quite charming...), but because I really felt Dicks should have fleshed it out a bit. Things were just a little too simple and, at the end of the book, I just didn't feel as fulfilled as I thought I should. I wish Dicks had gone deeper into Caroline's past and her relationships with her mother, her sister, and her best friend--but it just wasn't there. I did enjoy this book--I wished there was more of it to enjoy--but I would still recommend it to someone looking for something light and sweet. I received an electronic copy of this book in return for an honest review.